De gueules au navire équipé d'or, voguant à dextre sur une mer de sinople, au chef d'argent semé de cinq hermines. By the way, great support from Cardiff fans in Nantes wednesday. Thank's again for that ! Aaah I see. I have misunderstood. Nantes is apart culturally from Vendee. I thought that Nantes was in Pays'De-Loire the same as Vendee so you shared identity but I see now you are in fact Breton and identify as such. You should be included in Brittany and not Pays=De-Loire. I understand fully. I didn't know this.Thank you for pointing this out to me. Very interesting. I stand corrected. Being a Breton makes you next to being Welsh so that's even better..
All except me it seems. Bobby Reid After scoring the 1st goal in our win over Bournemouth yesterday. I think that many welsh people don't care about it, Joecity. Hermine Jaune is convinced that Britain is the centre of the world... I think he had nightmares last night, because his "welsh cousins" don't care about history of his beloved Britain. Oh ok. Tell him he can sleep soundly tonight. Maybe get himself an extra pillow, have an extra hour in bed safe in the knowledge that Wales is actually the center of the world. Actually, in Loire-Atlantique, the "county" (département, in french) where Nantes is located, only 2% of people understand britton language, whereas half of population in Wales speak fluently welsh language... The comparison is not very relevant. Actually, in Loire-Atlantique "county" (département, in french) only 2% of people understand britton language, whereas half of population in Wales speak fluently welsh language... The comparison is not very relevant. There are plenty of people in Wales who think that Welsh should not be spoken and consider it to be a waste of money. This happens a lot more in the industrial south where we live. Also there was a time when the owners of coal mines and steel works tried to ban Welsh being spoken, around the year 1840. Accounts differ but it's generally excepted this is the case. I could never imagine France being like this about the Bretton language. Perhaps some may so it has no relevance but was it ever persecuted? I don't know. I would be interested to know. Krishna a écrit : Actually, in Loire-Atlantique "county" (département, in french) only 2% of people understand britton language, whereas half of population in Wales speak fluently welsh language... The comparison is not very relevant. Britton language was denigrated and got laughed by parisian politics during 19th and early-20th century. Schoolchildren who tried to speak in britton at school were scolded or punished. However, people weren't thrown in jail for this, so in my opinion, "persecuted" is an excessive word. During this period, french was the only language authorized to be taught in Brittany schools (as well as in the rest of France). Nowadays (since the end of WW2), things have changed, some schools teach britton (called diwan schhols). Thanks. That's interesting. I use the term persecuted in a rounder sense. Not in the literal sense. I sometimes thinks can get lost in translation.19th and 20th century you say? Very interesting. Very similar to the Weish language then in that respect. Children could be made to wear or carry a piece of slate or wood for speaking Welsh in school in this period. I suppose in many ways this a by product of the Industrial revolution that happened around the same time. Nantes is a docks the same as Cardiff. Cardiff is very cosmopolitan due to our docks, generations have settled from all over the World dating back to 1850 and yet further still. I've been to Nantes and it's beautiful. Is the make up of the population similar. I have only ever visited for a few hours at a time on a few occasions. Is it very multicultural outside of the city center. In the first half of the 20th century it reached 1.3 million speakers, but nowadays it has gone down to 200,000 everyday speakers. At the beginning of the 20th century, half of the population of Lower Brittany knew only Breton; the other half were bilingual. By 1950, there were only 100,000 monolingual Bretons, and this rapid decline has continued, with likely no monolingual speakers left today. Breton has not the status of offical language (welsh has in uk), and France is one of the countries that has not ratified (uk had) the european charter for regional or minority languages. Today, Breton is the only living Celtic language that is not recognized by a national government as an official or regional language. Politics in France are never "multicultural" (as they are ine the north of europe, including uk), and french is seen as a "universal language" that must be the only one ! France has a "bilingual politic" outside the country (promote biliguism in states that speak franch, like canada, or many african states), but doesn't tolerate bilinguism or multiculturalism in france. And it's not only languages, regions in France have absolutely no power, no prerogatives, all come from Paris. It's a real fight here to obtain something (a big subject here and now is the "reunificaiton of brittany"..). An example : in 1960, 6 children of a family had "lost" their french nationality, because they were given breton firstnames. After 15 years of disputes in the French courts, the European Court of Justice recognized Breton Nationality for the six children of Jean-Jacques and Mireille Manrot-Le Goarnig; they are "European Citizens of Breton Nationality". In a way, Cardiff and Nantes fan are brothers in tears. Absolutely breathtaking and full of respect, as almost all we've seen coming from Cardiff. Thanks for sharing, Joe. 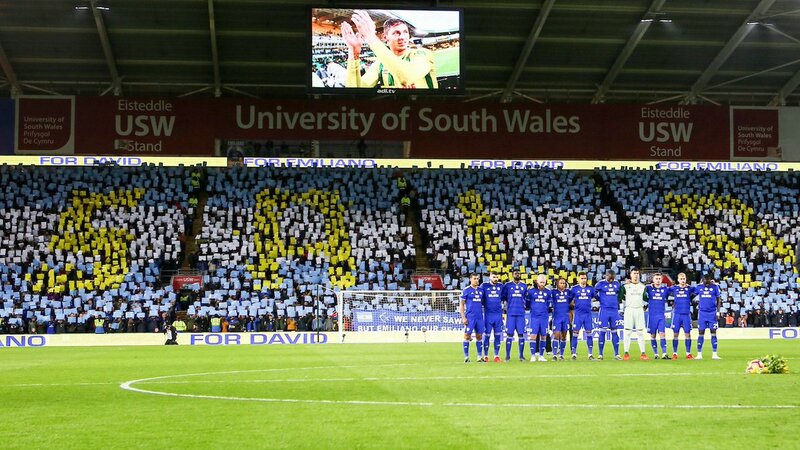 I must say it's quite unbelievable to see how all Cardiff fans & people took part in celebrating Emiliano's memory. I already said it on your message board, but even if you never saw Emi play a game for you, you gave a wonderful image of unity. As we're all thinking here, I really hope for an annual game between our teams (I would personally say 2 games: one in Nantes, and one in Cardiff), kind of a celebration. We were already twinned by city, but as your own banners aptly said it, we're now twinned in grief. Really hope we'll do this. Anyway, thanks for coming there, and for all your support ! ♪ Be true to it, do it. Please, don't forget Brian in the kitchen. It would be a great idea to organize an amical ( friendly ?) game between our two teams isn't it ? Que j'aime le son du ballon au fond des filets adverses. LePhasme a écrit : Please, don't forget Brian in the kitchen. Biran is still in the kitchen ! Je suis un supporteur de Cardiff Cit qui habite aux Deux Sevres depuis plusieurs ans. Nos cities sont vraiment jumelées. Nous ne devons jamais oublier notre connection. Bon courage mes amis et bon chance FC Nantes. J'espère que vous aller vous maintenir en PL, je vais suivre tout ca de près. Yes we are united in grief. Maybe one day we could be united in good times. Also....Quest ce qu'on mange Brian? Brian dans le cuisine....savoreuex I hope... Moules et frites this time of year. I'll come for dinner. So much sadness and pain. Pour tout commentaire sur la modération, merci de ne pas polluer les fils et d'utiliser la rubrique "Vos remarques" ou les MP. Présent sur le forum depuis 2002.